Duroc Ham comes from a heritage breed of pork that's coveted for its juiciness and rich flavor. By slow-smoking each whole-muscle Duroc ham up to eight hours,our master butchers ensure you experience uniquely rich, savory country-ham flavor in every bite. And now, you can get these perfectly cured, fully cooked (it's thaw & serve easy!) delicacies delivered right to your door. Famous for superior tenderness and rich pork flavor Natural juiciness and dense marbling Cured to perfection with water, salt, and sugar Real hickory smoked up to 8 hours Fully cooked whole-muscle ham - just thaw and serve! Delight your holiday guests by adding our super-juicy Duroc Boneless Country Ham to your menu this year. 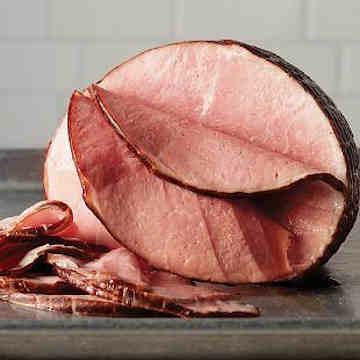 Or keep this outrageously tasty ham on hand for an unbelievable everyday entree. Either way, you're winning. Our meat-obsessed butchers put their all into making our Duroc Ham pure savory perfection. It starts with genuine Duroc pork. This premium pork variety is coveted for its high percentage of marbling, which gives it superior tenderness and natural juiciness. Proper curing is the secret to transforming great pork into great ham. Our butchers expertly cured every ounce of Duroc pork with a timeless combination of water, salt, and sugar. Through this process, they amplify the pork's naturally rich flavor. After curing, we slow smoke each and every Duroc Ham up to 8 hours with real hickory wood smoke. This elaborate method results in the perfect balance of savory, juicy flavor (with just a hint of smoky depth) and delectable, tender texture. But we didn't stop with smoking… Plus, our Duroc Boneless Country Ham arrives fully cooked, so you barely have to lift a finger in order to indulge in its wealth of savory goodness. All you have to do is thaw your ham in the refrigerator and it's ready to slice and enjoy. Of course, if you prefer your ham heated, it only takes minutes in the oven to reach the ideal temp. Don't wait until then next big holiday feast to treat your family to this incredible ham - order today! Place frozen ham in refrigerator for 26-28 hours. Remove from refrigerator and serve or cook as directed. This ham is fully cooked and can be eaten without reheating. Roaster Method: To serve hot. Remove ham from packaging. Place ham on a roasting rack in a roaster cut side down. Pour water in the bottom of the roaster until water is within 1/4 inch of the base of the ham. Put cover on roaster and cook at 275�F for 18-20 minutes per pound or until internal temperature reaches 140�F. Oven Method: Preheat oven to 275�F. Remove ham from packaging and place cut side down in a roasting pan on a roasting rack. Pour water in bottom of pan until water is within 1/4 inch of the base of the ham. Cover ham with a piece of parchment paper and cover with foil. Place ham in oven on middle rack. Bake for 2 1/2-3 hours until ham reaches internal temperature of 140�F. Ingredients: Ham Cured With: Water, Salt, Sugar, Sodium Phosphate, Sodium Erythorbate, Sodium Nitrite.